This modern villa is located in the Bishop's Lodge Villas, just 2.5 miles north of the Plaza. This comfortable home is bright with many large windows. The master bedroom suite has a king size bed and its own private kiva fireplace. The master suite comes with a private bathroom with granite counter tops and double sinks with a separate tub/jacuzzi and shower. The second bedroom has two queen size beds and its own private bathroom with shower/bath tub and separate sink area. The kitchen is fully equipped and opens onto a formal dining area. The living room is just steps below the dining area and has a large fireplace and floor to ceiling windows with unobstructed views. The villa is wonderfully positioned and landscaped with outdoor furnishings. The villa also has air conditioning, washer and dryer, high speed internet with Wi-Fi, and digital television. The outdoor spaces open up to expansive views to the West, perfect for sunsets and mountain views. 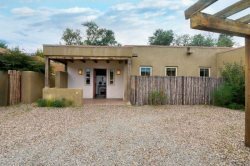 The home is adjacent to 200 acres of the Santa Fe National Forest with multiple hiking trails that are available and easily accessible. There will be a pool fee of $10 a day assessed to each reservation in the months from May through October that the pool is open. A pool waiver must be signed upon check-in for the acceptance of the pool keys.